The Abaxis VetScan VUE is the first app-based diagnostic instrument in the veterinary marketplace. Paired with patented Rapid Test cartridges and the VUE mobile app, veterinarians are now able to quickly scan patient samples, diagnose life-threatening diseases and automatically document the results in the patient’s chart from the exam room. Obtaining accurate test results is the most critical task in the diagnosis of infectious diseases. Prior to the Vetscan VUE, veterinary staff were required to hand treat each Rapid Test and then perform a visual eye exam to determine the results. The purpose of integrating the Vetscan VUE reader and the VUE app was to deliver accurate results on every test while simultaneously saving time for the veterinary staff. 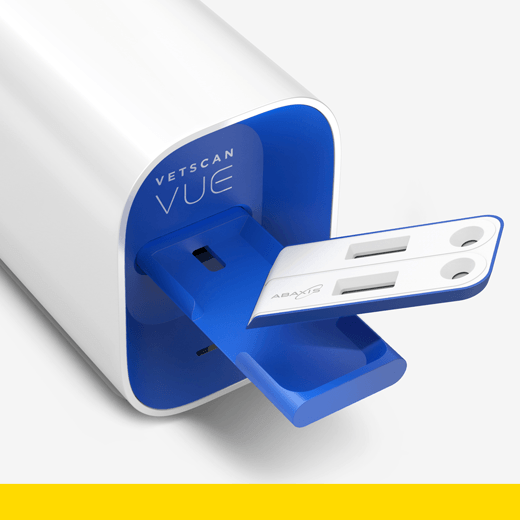 By utilizing the user’s mobile device, the VUE is reduced to a quarter of the size of related devices and has only one physical touchpoint: the Rapid Test drawer.